An invitation to visit my friend Thad in Kennewick Washington and spend a 3 day weekend 1000 mile ride based at the WR Ranch in Fossil OR riding with a group of PNW sportbike riders was too good to pass up - so I made the 2200 mile trip up there from Texas - it was worth the ride! A side trip to Hood River OR for the 4th of July, then another jaunt to Montana and Glacier National Park, Wyoming and Colorado before heading home - total ride mileage of 6300+ miles. Most photos by me , with some photos by Thad Stelly and Eric Anderson taken in Fossil OR. 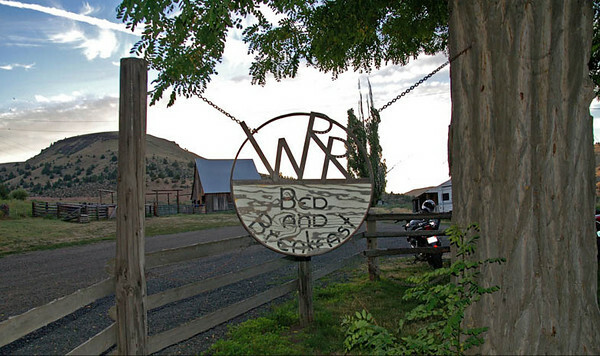 WR Ranch sign - this ranch is a 18,000 acre working ranch in Fossil - East central Oregon. Phil and Nancy Wilson run it and have a fantastic Bed & Breakfast that will sleep up to 16 people. They have a map inside of where their guests are from - All over the world , even Siberia!